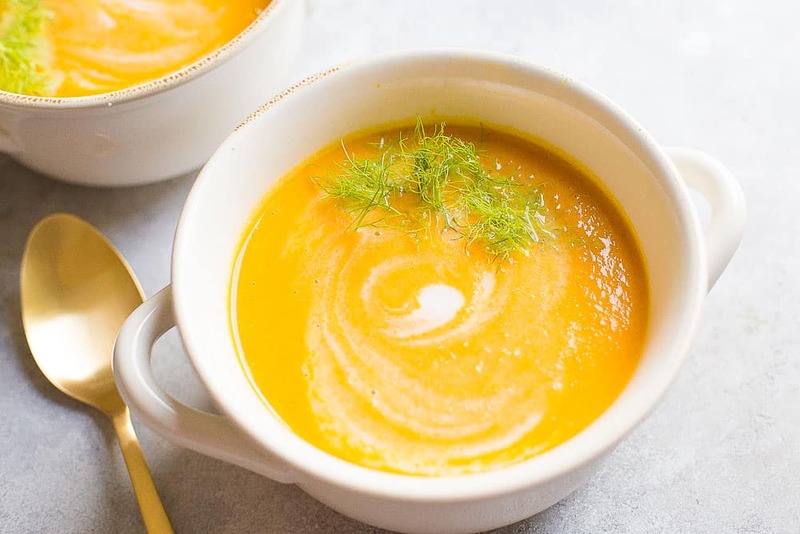 Creamy Carrot and Ginger Soup is a simple, yet flavorful Vegan soup that is packed full of goodness! 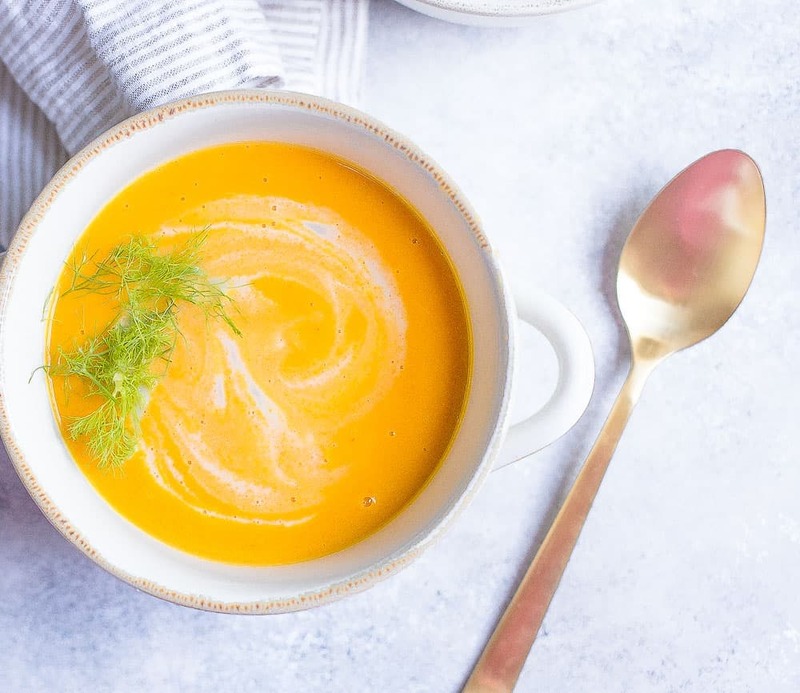 Chopped fresh ginger is blended with chunks of carrot and coconut milk to create this creamy, delicious soup. One that provides the ultimate comfort on a cold day! 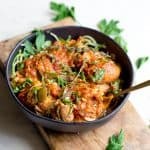 Can be made on the stovetop or Instant Pot. I love this soup. Like…. LOVE LOVE LOVE everything about it! It even has a special place in my heart because of the inspiration behind it. My sweet little girl, Miss Carbivore, and I used to lunch once a week at this fabulous little cafe in Germany. It was attached to an organic farm that we would visit weekly to pick out our eggs, dairy, meat, and fresh produce. During our homeschool days, she and I spent many special moments together at this cafe. We would often bring a book to read together, or work on other little school projects. We always coupled this with a big bowl of yummy carrot and ginger soup, and followed the meal with a cup of tea. It was always our favorite part of the week! Now that we have moved back to the US, these memories are some of my favorite memories that I hold of our entire 4 year experience traveling Europe! In fact, she ate 3 bowls for dinner the other night! Three bowls! The kid has the stomach the size of a grape, and she somehow managed 3 bowls of this because it’s her absolute favorite. The little man also gobbled up his bowl, and they both enthusiastically asked to have it packed in their lunchbox. Such a great feeling as a mom when your kids appreciate your cooking. So now I want you to try! 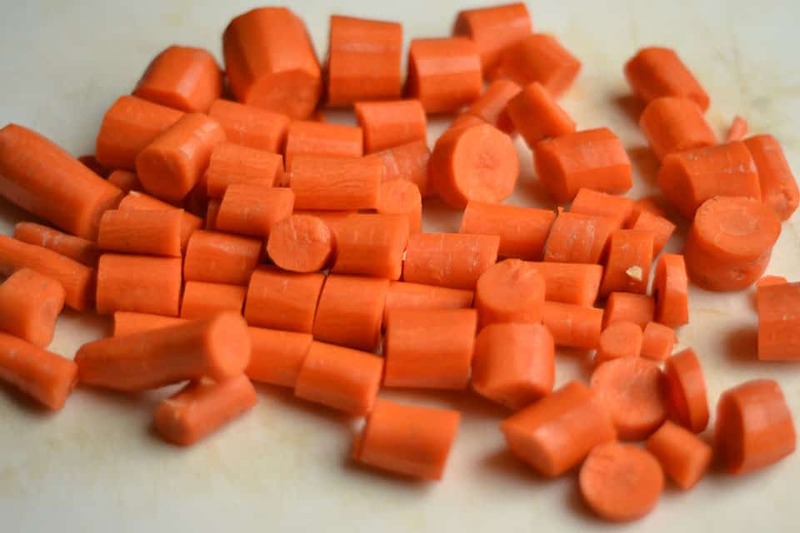 You can also use baby carrots to make it even easier. I used Coconut Cream from Trader Joes as part of the base. It is awesome. I encourage you to try if you have a TJ’s nearby! If not, full fat coconut milk also works well. Serve with some crusty bread or a salad for an easy meatless monday dish. Or make for a comforting lunch on the weekend. I promise you’ll love it as much as my little family! Reduce heat to simmer. Cook until carrots are nice and soft, about 25 minutes. Slowly stir in coconut milk (or coconut cream if using). With an immersion blender, blend soup until smooth. You can also use a regular blender and blend in batches. Add salt to taste. Serve hot! Select the saute function on your IP. Once hot, add oil and onion. Let saute for 2-3 minutes, then add garlic and ginger and saute for another 2 minutes. Select cancel on your IP. Add carrots and broth. Secure the lid. Now select the manual function, and cook on high pressure for 6 minutes. Use a quick release. Stir in coconut milk, salt (add more to taste if needed). Using a blender or immersion blender, blend until creamy. I get carried away with ginger. I may have even used around 4 tbsp. If you want the ginger to be a more subtle taste, than cut it to about 1-2 tbsp. Amy, great recipe!! 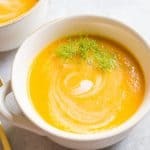 I make a similar carrot ginger soup, but I roast half of the carrots before adding them to the soup, which I think gives a little depth of flavor. I can’t wait to make your mushroom green bean skillet!! Also, the roasting was not my idea. I got it from GOOP. Looking forward to your next recipe!! I see you have an asterisk by fresh ginger. Why is that. I can’t find the Asterisk anywhere. Can you please reply. Sorry for the confusion! Just in the notes I write how I get carried away with a TON of ginger, and you can scale it back a bit if you want. I have made this twice now. I’m really loving it! I have tweeted it to my taste, adding 3 small garlic, about an extra half pound of carrots and also more ginger. I can’t get enough! This recipe is awesome. I add a half pound more carrots. So delish! I just made this and it was as ahhhmazing as you said! That coconut cream kinda puts the ahhh in ahhhhmazing! Yay!! Glad you loved it!!! Do you use the original Trader Joe’s coconuts cream or the new organic version? I’ve used both, it won’t matter which one you choose. This soup was AWESOME! I used about 10 carrots, about 5tbs of ginger, and veg broth instead of stock. I did not add salt because I used broth. I could not belive the result. 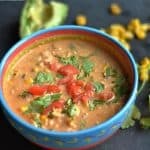 Why haven’t I made this soup before?! This is definitely going to become a permanent addition to my recipe book. I made this in my instant pot and it turned out really good. Will definitely be making this again! This soup is unbelievable. I am a cook in the making and this is fenomenal!!!! Hi Judy, I have never froze this soup because of the coconut milk. You could try, but normally coconut milk does not freeze well. Assuming there’s any left to freeze – because it’s sooooo good! … seriously though I have frozen portions of this many times and it’s just as good thawed and reheated as when freshly made! love this recipe, my only change was making it a 3x batch so i could freeze the bulk servings to eat for lunches. First time I grew carrots and first time making carrot soup. This recipe appealed to me as had all ingredients and was simple. It was absolutely amazing.as flavorful as it was colorful. I topped with toasted pumpkin seeds and sprinkled with red pepper flakes. Hi. This recipe looks great. I don’t have an instant pot though. Have you tried making this on the stove top? I have never left a comment on a food blog/recipe before….but I just HAD to for this. This soup is absolutely amazing. When I took that first bite it was like a taste explosion and brought a smile to my face. Even my 6 year old loved it! My immersion blender didn’t break down the ginger as much as it should have probably, but I have no problem with ginger chunks – and didn’t feel like batching it through my Blendtec. Thank you for sharing this!! You are so welcome, Jena! Thanks for stopping by, so glad you loved it! Amy this soup is delicious! I made it prior to starting While 30 and have already made it twice. This will definitely be a part of my regimen! So glad I found your website can’t wait to try many more of your recipes! Do you think this would be okay without onions? Wanted to make today and have everything but the onion. Onion powder maybe? You could definitely do it without onions. I think it adds to the flavor, but can be left out. 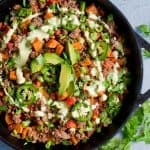 This is a winner recipe! What can i say? They’re really delicious! Delicious! Mine came out a little thin tho, any advice on a thicker consistency? 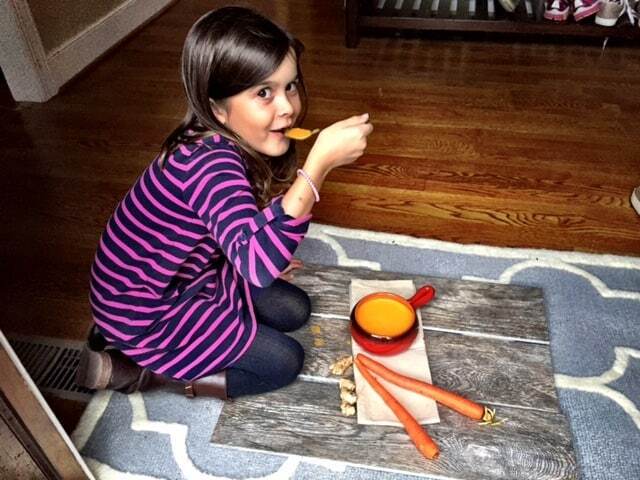 You can add some more carrots next time, maybe another 5-6 large carrots or cut down the broth by 1 cup! That makes me happy!! 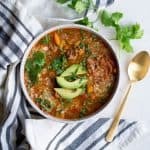 This is such a nutrient dense and yummy soup! I enjoyed your soup recipe very much thank you. It was delicious. Substitute with another dairy free milk, but only use about 1/2 cup. I just made this soup and it came out absolutely amazing. I’m not vegan so I substituted heavy cream and used bouillon cubes and water instead of stock. I also used at least 4 tablespoons of ginger and 4 cloves of garlic since I love me some garlic. 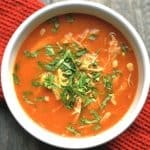 This delicious and simple soup is definitely going to be made again! Thank you for sharing it!! After trying a not so great carrot ginger soup recipe (I poured it down the drain) I was determined to keep looking. So glad I found this one – it is incredible!! The can of coconut cream at my market was only 5.4 oz, but it was just the right amount for my taste. Thanks for this great recipe!! 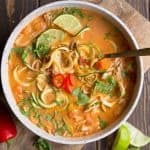 What can I use in place of coconut milk/cream? Unfortunately, my husband is allergic to any kind of coconut products. You can omit it all together. It is still really yummy, just doesn’t have that creamy finish. Enjoy! This is AMAZIIIIING! 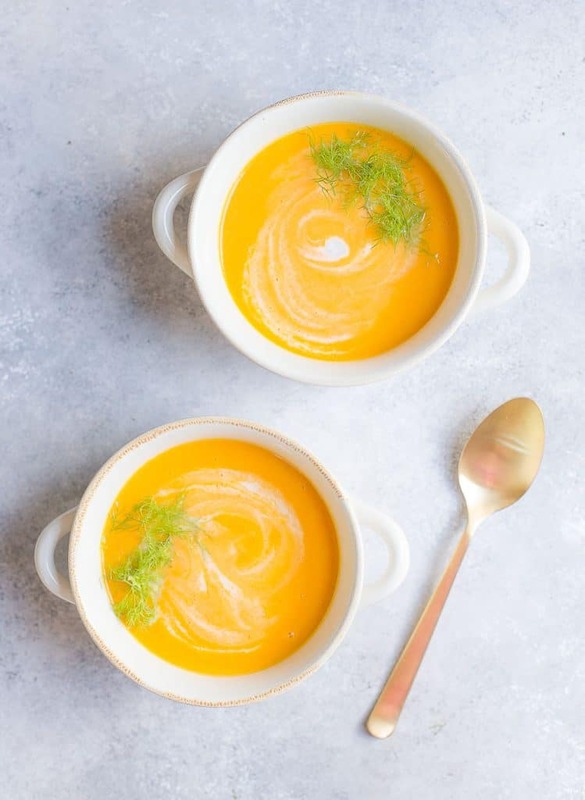 I love creamy soups and I quit diary and meat so I was trying to find a replacement to my carrot cream soup and omg this is so delicous !!! I just made it and had a spoon to taste and wow !! 100% better than using heavy cream ! This was out of control delicious. I’m actually regretting I didn’t double the recipe immediately…we were hoping to make this last for a couple lunches this week but that seems unlikely! Love hearing that! Thanks, Jessie! How many servings does it make? Preparing it for a soup course for dinner club this evening. No idea how many ser ings it will mak. Help! 4 larger servings, 6 smaller ones. You can easily double it! You recommended to use Trader Joe’s Coconut Cream but I saw online there is an original (brown can) and new Organic Coconut Cream (blue can) where people preferred the old version which I can still buy online. Which do you use in your recipe? 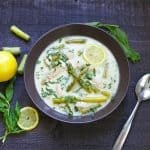 I literally make this recipe all the time, and have used many different kinds of canned coconut milk. I honestly think it always tastes delicious! I would buy one that is easy to purchase at your closest grocery store. This soup is Wonderful! I started the onions and garlic on saute in Instant Pot,I batched out (32 oz. per batch) chicken broth, ginger, almost 2 lbs. carrots, some cracked pepper sea salt, a couple pinches smoked paprika and 5 tiny red sweet peppers in the Vitamix, added 1/2 of the onions to each batch, and poured into the IP on slow cook for 5 hours….YUM!!!!! Where’s the protein? This is not a complete meal,although it sounds like a yummy soup. Indeed; as written, this soup is not a complete meal. Feel free to add protein if you want! This is my go to! I’ve added curry for an extra kick 🙂 Thank you!!! Hi. Someone asked this before but I didn’t see the reply: how many calories per serving? And what is the serving size? It’s at the bottom of the recipe card below the notes section. Approximately 281 calories for almost 2 cups of soup. This was delicious! I added about 1 cup leftover roasted carrots and sweet potatoes to the raw carrots in the instant pot. I also halved the coconut milk and it still turned out nice and creamy. Really really good! I probably added 4-5 tbsp of ginger, and a few tbsp of brown sugar. Its divine! Excellent soup! This will become one of our recipes on rotation! This soup is AMAZING!!!! You saved me! I threw a wedding shower for a friend with tons of food allergies (no dairy, no onions, no garlic, no grain, and about 30 other sensitivities). I was pretty stressed out how to make a super delicious meal, but once I found this recipe I knew I was on the home stretch. I made 5 items that all turned out well, but this was the HIT. I had to share the recipe with the guest of honor and others asked for it as well. My family even liked it so much that I’m now making another double batch just 5 days later. It is simmering on the stove and my kids can hardly wait until they can have a bowl…the smell is tantalizing… THANK YOU! Yay!! So glad it worked out, you are welcome!! !